A pair of empty Russian Orlan spacesuits are pictured inside the airlock of the Pirs docking compartment. 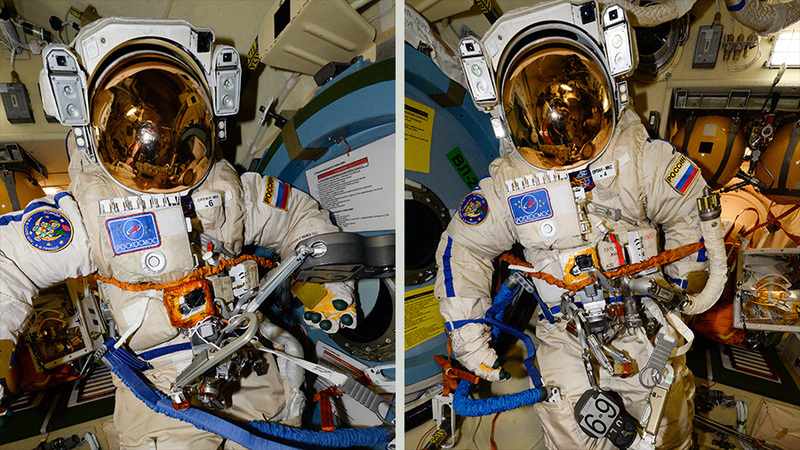 The spacesuits will be worn during a Feb. 2 spacewalk with cosmonauts Alexander Misurkin and Anton Shkaplerov. As the International Space Program gets ready for a pair of spacewalks in February, the Expedition 54 crew was busy setting up a pair of experimental internal satellites and conducting vision checks today. NASA astronauts Joe Acaba and Mark Vande Hei brought out a pair of tiny satellites, also known as SPHERES (Synchronized Position Hold, Engage, Reorient, Experimental Satellites), for a run of the SmoothNAV experiment today. The study is researching how algorithms and sensors may help determine relative positions and velocities between spacecraft. Both astronauts also joined Flight Engineers Scott Tingle and Norishige Kanai for eye exams during the afternoon. Tingle and Kanai first swapped roles as Crew Medical Officer checking each other’s eyes today using optical coherence tomography. Then Tingle joined Acaba and Vande Hei afterward for more eye checks using a fundoscope. Doctors on the ground remotely assisted the astronauts viewing their eyes in real time. Cosmonauts Alexander Misurkin and Anton Shkaplerov donned their Orlan spacesuits today to ensure a good fit and check for pressure leaks ahead of a spacewalk scheduled to start Friday at 10:30 a.m. EST. They’ll work outside for about 6.5 hours of maintenance on the Russian side of the orbital laboratory. The second spacewalk is set to take place Feb. 15 at 7:10 a.m. when Vande Hei and Kanai exit the station to continue robotics maintenance on the Canadarm2. They’ll stow a pair of latching end effectors, or robotic hands, which had been detached from the Canadarm2 on two previous spacewalks, the first on Oct. 5, 2017 and the second on Jan. 23. Thank you for sharing these videos and images for The Super Blue Blood Moon of the total lunar eclipse, I would kindly share may thoughts to explain the physics reasons beyond changing the color of the Moon during this Eclipse. The main reason is THE LIGHT DIFFERENT PHNOMENON and perhaps this eclipse is not 100% Eclipse, maybe 99% eclipse, where 1% no eclipse is sufficient to pass Sun’s Rays to creates a light different phenomenon above the Moon. Because THE LIGHT DIFFERENT PHNOMENON defined as the bending of light around the corners of an obstacle or aperture into the region of geometrical shadow of the obstacle that mean passing the light at a parallel dimension of the material object therefor the different phenomenon occurs due to the attraction between light’s Photons and The Material of The Object that stands nearby the direction of the light, and the value of THE LIGHT DIFFERENT PHNOMENON depends upon the wavelength of the light. Therefor during moon moves around the earth will passes in a different areas of The Sun light different FREQUENCIES zones thus once the moon will appear as Red then Blue etc. exactly when we move our hand beyond The Prism we could see it in the different colors. Will the Russian Spacewalk on Friday be televised on NASA TV? Hi. Thanks so much for sharing what you are doing in the ISS. My 5 year old daughter has just been learning about robots and has now started a school project about space. She and the class are really excited and have really motivated teachers. She has a space station in the class room and they are learning all about planets and moons. Last night in Ramsgate, England the sky was completely clear and we watched you fly past around 1820 GMT. She was in awe. Isobel was really excited to hear that you were testing each other’s eyes “just like mummy” because her mummy is an optometrist. Mummy was just jealous that you had an OCT in space as she’s never worked anywhere on Earth with one yet! I know you will all be super busy- but Isobel wanted to ask you some questions… she would be amazed if you had time to post a reply. 1.do you play games in space? 2.how do you do make sure you don’t fall off when you do a space walk? 3. So you have pictures from Home. Many thanks and enjoy your time. The astronauts do have free time while living in space to do things like play games, watch movies, read books, talk with family and take pictures of the Earth below. During spacewalks the astronauts are tethered to the space station at all times to prevent them from falling off. They also have jetpacks on their spacesuits they can use to fly back to the station in the unlikely event they become untethered.